I've been pushing pretty hard these past few weeks in my training. I was gearing up for the Twin Cities Marathon in October but now that I'm working for TCM, I can't run it. Any suggestions on what to run instead? I'm thinking either Whistlestop, Richmond, or Outer Banks. 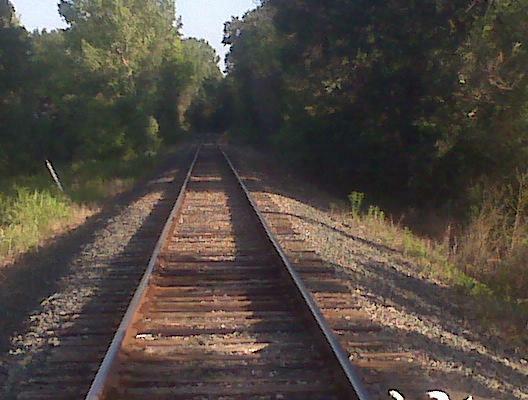 It's slightly hard to see (okay, almost impossible) but there is a deer on the tracks. After our little walk, the dog and I went swimming. Rather, I ran laps in the shallow end of the pool while she would jump in after a frisbee. This was the first time I have ever done any pool running and it hurt my shins a lot. I don't have shin splints or anything and it was more in the muscle on the outside of my shin than on the bone. A good workout, nonetheless. Question: What's your favorite form of cross-training? I know what you mean! Running makes me feel so great, it's hard to get the same effect from any other type of exercise!